It is the opinion of many, many people that Rich Dad, Poor Dad is the worst personal finance book. It is widely considered the Gigli of personal finance books. That said, there are some strong supporters of the book, but they appear to be in the minority. If it’s possible to learn from what many consider one of the worst books, imagine what you could learn from a good one. It is this premise that made me dig into Rich Dad, Poor Dad to come up with some useful things I learned. Because of this, I turn a blind eye toward Robert Kiyosaki inventing a few characters to tell a compelling story to get his point across. There are any number of myths and fables that entertain and teach us at the same time. When I went through the book I came up with three ideas that I thought would help many with their personal finances. Assets vs. Liabilities – The average American doesn’t really think in terms of assets and liabilities. They tend to want the new iPod right now. There is little thought to paying interest. There is little thought to the accessories that you “need” with an iPod (case, car charger, FM transmitter, etc.). According to some, Mr. Kiyosaki takes things a little far by not including your home as an asset (if you own it), but in general he does a very good job of getting readings focused on buying things that make you more money rather than depreciating assets. Know Your Taxes – Mr. Kiyosaki is big on hiring smart people if they can save or make you money. He says he has a very good tax advisor who saves him much more money than he is paid. Recently, I’ve been looking at my taxes and finding legal ways that I can minimize my taxes. Have a Dream – Many people will say that Kiyosaki doesn’t give a lot of concrete advice that the average person can use. I would agree with them. However, he is great at in convincing people to think about their money and how it can buy them freedom. This is a very good motivator to get people thinking. It made me think quite a bit and this website is the result of trying to find a way to organize those thoughts. The next time you hear that a book is bad, it might be worth reading it anyway. Just like how everyone you meet can teach you something, many books can do the same. Yeah, I’ve read it and wasn’t enormously impressed but if you can take it as an inspirational book with big ideas rather than literal step-by-step advice I can see why it’s worth reading. And many people certainly seem to be inspired by it. The “worst” money book I’ve read is the Millionaire Next Door. I can’t believe its popularity, beyond the statistical issues I do believe it’s the most boring non-fiction book I’ve ever picked up and dragged myself through. I agree, I’m one of those people who think this is a terrible book with a few useful nuggets that happen to be in it. My favorite forehead slapper was Robert’s “little money making tip” that as I recall was randomly thrown in: just buy $10,000 worth of stock, sell half when it doubles to get your principal out, then reinvest it. Just pick any stock, any stock at all – it’s just that easy! (I suspect that Robert might have forgotten to delete that one from the manuscript before it went to print, or perhaps not considering the rest of the book). What turned out to be immensely useful to me was not Robert’s book, but another book that it referenced: G.S. Clason’s Richest Man in Babylon. If nothing else, my college education at least taught me to read footnotes, and this is one of the gems that doing so turned up. I just wish I had read this footnote in a borrowed copy of Kiyosaki’s book instead of the copy I paid for! 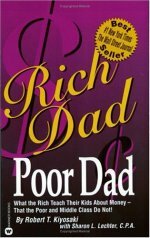 Rich Dad Poor Dad is an excellent book, you just have to read it as it’s intended. So easy to read, and it frames your mind into a way of analysing the opportunities. When I read it, it was the first book that espoused something different than the boring common blah blah blah of saving forever. It ties, in a concrete way, the quest for wealth and the quest for a decent life. For that it earns a place as one of the best personal finance books. Richest Man in Babylon, which I consider to be the grandfather of the boring books, has been reproduced and modernized by everyone, but it’s the one I consider to have invented saving, pay yourself first, and investing in interest-bearing assets. Read that book and skip all the rehashes. Then read Rich-Dad Poor-Dad, and skip all the “Millionaire mind” type rehashes of that one. I’ve never liked this book, there’s something about it that doesn’t seem right. I suspect Kiyosaki can “inspire” me only if his book spoke about ways to make a ton of money selling books and courses on how to get rich. Other than that, nothing useful. This book, weaknesses and all, still managed to flip a switch in my head that I could become truly wealthy. I started reading the book at about 10pm and I didn’t stop until the book was done at about 3:30am. I had read books about investing before but this was the first time it really motivated me to do something different. Before I knew well enough to put money into a 401(k) but after reading Rich Dad I started looking into diversifying my income streams and being an entrepreneur. I may never have started blogging or tracking my net worth unless I read Kiyosaki’s book. In retrospect he makes it seem too easy, too quick. He was deceptive about the fictional nature of his characters. The book is completely devoid of practical suggestions and nearly all of his investment ‘ideas’ are any good (and some may border on reckless). Read the book for inspiration and then look elsewhere to learn the implementation. I liked the stories, but the actual advice wasn’t that helpful. I did like it because of the ‘mental attitude’ change it gave me. The whole bit about working FOR someone else vs. working for yourself kind of rung true with me. Wow, I thought I was going to be able to go the rest of my life without ever hearing about or seeing Gigli again. I just threw up a little in my mouth. This is the book that you like when you’re starting out and then hate once you know what you’re doing. But it’s still a great place to start. I read one of his other books from the library (investing? something about quadrants?) and while I found a lot of it either wrong or insipid, it did flip a switch as Adfecto said, and got me very interesting in things like investing and starting my own business. I think that excitement was well worth the time spent reading the book. It could be pretty dangerous if you take all of it as truth I suppose. I’ll always side with the book slightly as it did jumpstart my entrepreneurial ways in highschool. I think there is a lot of fluff and it may lead some people to do irrational things like quit their job or drop out of school to start a business with no experience. However, the fluff helps him sell so many books. At the end of the day he’s an entrepreneur and he wants to make money. The latest book with trump was pure garbage..but it made them money. Like any book, you have to take the good and apply it to your life. I still think theres a lot of good in the book as long as you aren’t so gullible and take it word for word. RK makes me shudder. I think there are a few good points, which you’ve drawn out. Same with other “bad” books. But I can’t help wondering if there aren’t lots of other writers who’ll teach you the same thing and more…better. At least borrow the book from the library, don’t support the empire. I love reading RDPD. I think the book was not meant for the average Joe. The average joe is in debt. His book is geared to the people that are not middle class or at least not thinking middle class. He is a Capitalist and you have to think like that in order to connect to the book. It is for business minded people, investors and real estate people. The average 9-5 worker may not get it. Overall is was an good read. I think my comments would mirror most of the other comments here. I have a master’s degree in accounting and I understand finance, etc. to a highly detailed level, and yet RDPD flipped a switch in my head. It made me realize that some of the ways we look at money have to change to achieve financial independence (a house is not an “asset”, “passive” income has to be the goal of investing, etc.). What burns me, again and again, is the idea that because Kiyosaki has some goofy schemes or made up a character implies that ALL ideas are idiotic. Should we discount Henry Ford’s ideas on mass production because he had some kooky anti-semitic ideas? No. The three tips you highlighted are good. I have never understood the hatred directed toward him. I love Rich Dad Poor Dad. Kiyosaki made me think. Anyone who makes me think – whether I agree or disagree – is someone I will gladly learn from. That’s why I continue to read this blog. I agree that RDPD is light on doable specifics, but as others have already said, I actually really liked the mind-set that the book presents – thinking in terms of assets and liabilities, and accumulating assets. That was a completely new way of thinking for me when I read this book a couple of years ago. For that reason alone, I think the book is worth reading. RDPD may have been one of the first personal finance books I read way back when. I remember thinking how good a book it was and how inspiring it was. I also remember thinking later on that it didn’t quite tell you how to achieve financial freedom. It just gave very loose guides based on his life. In fact I remember thinking what a great idea he has in that you would have to buy all his other books to really understand the details of what he was saying. In all the book served it’s purpose for me. It made me think about my financial situation and start making changes. I’ve tried to read it again but it didn’t quite hold me the same way a second time. Nowadays a person can get the same inspiration from blogs like this. Yeah, I read it recently, and I wasn’t too impressed. Actually, i listened to the audiobook and that was a smart move because I could tune in and out as I pleased while I was driving in the car. I wrote about it on erikfolgate.com and the few things that I learned from it, but the advice was so vague and more like a motivational speech. I think that is his main goal though, to motivate people to learn more about personal finance and becoming wealthy. I took it as more of a book to get your mind thinking towards becoming wealthy, rather than a step-by-step guide to becoming wealthy. Lazy Man, I think your review of the book was a fair one and I also noticed that you did what most people did – you prejudged. You heard it was crap, read somewhere that it was crap, felt that it was crap and therefore never read it (if “dig” means read). [Editor’s note: It was the first personal finance book that I’ve read, months before I read personal finance sites. I heard it was great, which is why I bought it rather than borrowing it from the library.] People tend to do that, yes, but it seems that being able to judge for yourself (which you did in the end) is a good idea. However, spending your time reading a book is not as quick as trying on shoes, so it must be a well thought-out decision on whether you will dedicated a couple hours of your life to a certain book or not (and against the advice of many). Therefore, I feel that – contrary to what you say at the end of your post – not from all books can one learn something. And by extension, not from all people can one learn something. Really… there are just some books and some people out there who aren’t worth a second thought! In closing, I feel “Rich Dad, Poor Dad” is a good first book for someone who knows completely nothing about finances. But they better go on to read a couple good books! RDPD is a book about the “whys” and not a book about the “hows”. It is intended to question common beliefs and very many people don’t like to have their beliefs questioned. Just imagine a biology book called “Evolution Dad Creationism Dad” written in the same style as RDPD. Such a book would discuss the scientific method, logic, evidence, etc. and how this provides an explanation of natural history while being fairly short on specifics. It would also contain many snide stabs at creationism dad on how creationism dad did not get into medical school, how he confused correlation with causation, etc. Some critiques would completely miss the point, which was about how to think about evolution and not about evolution per se, and complain that the author does not tell us what else to believe in or that he doesn’t give us a list of places where we can worship evolution. I think there are enough good ones that digging through the bad for the good points may be tough for some of us. Millionaire Next Door is one not universally praised. “Survivorship Bias” is the largest attack against it. No argument there. If you’re looking for a book to guide you step by step to getting rich, you’re never going to get there. Principles can be taught, but the specifics you have to learn on your own since everything is a little bit different in the details. I played his cash flow game, what a crock. I read Rich Dad and the Cash Flow Quadrant. I agree with some of Kiyosaki’s advice and disagree with some. I have definiely read worse books on personal finance. I’m not a big fan of anyone who recommends getting into a lot of leveraged debt. But, holding real assets makes a lot of sense. Especially, with the U.S. Government printing money so fast, that it’s decimating the dollar. I also like the advice of getting into business for yourself, instad of counting on a career path. One good thing about this book is that it can motivate a person to start thinking about money in a new light. But there are so, so many other books out there that can do the same and much better. The really bad thing about this book is that it makes it seem so easy to make money, and many people will rush into buying stocks, real estate or gold and think that that’s their ticket to being a millionaire. I actually bought this book, and rather than selling it on eBay, I just tossed it in the trash because I didn’t want other people reading this garbage!